The grosgrain ribbons we offer are available in a variety of options in terms of dimensions and color. Moreover, you can also get the desired patterns and designs for these. The best part about buying with BB Crafts is that we think from the customerâ€™s point of view and keep a check on the affordability. 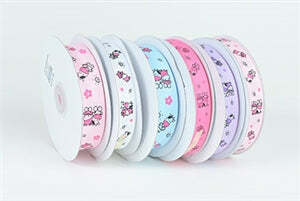 This cute looking moo moo cow print grosgrain ribbon is best to be used at the baby shower party. You can even use this to tie the gifts, as this will add an adorable setting to the party atmosphere. These types of printed grosgrain ribbons work as a perfect choice to be used for wrapping gifts and managing craft projects. Well, this is not all that can be done with these cute ribbon supplies; these can even be used for the embellishment of accessories and much more. The colors available in these ribbons are lavender, hot pink, yellow, light pink, light blue, and white. If you need to save more on your ribbon purchase with BB Crafts, then it is suggested to buy bulk quantities.